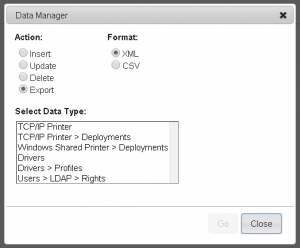 The Data Manager can be used to export, import, update, and delete; printers, printer deployments, drivers, driver profiles, and users en masse using a CSV or XML file. Go to Tools -> Import / Export -> Data Manager. Select the Action, select the Data Type, and select the Format click Go, and save the CSV or XML anywhere you want. Go to Tools -> Import / Export -> Data Manager. Select the Action, select the Data Type, and select the Format click Go, and select the CSV or XML file containing the objects to be added. With this feature you can export, import, update and delete, printer objects from a list of all TCP/IP printers in the Printer Installer database to a CSV or XML file. This can be useful as a reference for auditing the printer objects with a third-party utility. It can also be a convenient way to convert a large number of unmanaged direct IP printers to PI-managed direct IP printers. Information contained in the CSV or XML includes the printer's name and folder, settings on the General tab, Port tab, Drivers tab, and Drivers / Profiles tab.The only column that is required is "Printer Name". If "Printer Folder" is not specified, the entire tree will be searched for a printer with a matching name. If more or less than one printer with that name is found, an error will occur. Printers will be identified by "Printer Name" and "Printer Folder". If "Printer Folder" is not specified, the entire tree will be searched for a printer with a matching name. If more or less than one printer with that name is found, an error will occur. If a column is not specified for a particular field, that field on the printer will not be modified. If the column is specified, but the value is blank, it will blank out the field on the printer. Printer deployments can be imported and edited in bulk with this method. It can be a convenient way to make or edit a large number deployments for a single printer or multiple printers. Drivers and driver profiles can also be exported using the Data Manager. It can be a convenient way to import or replace many new drivers into printer installer.